The Anglo-Saxon, Celtic and Boer British, who are all Israelite People of Southern Africa, have gone away from God Whose Contract they swore with Moses, the British Levite not Judahite (Exodus 6:19-20), at Mount Sinai to keep, forever (Deuteronomy 29:15). King of kings’ Bible Genesis 28:14 And thy seed shall be as “the dust of the earth”, and thou shalt spread abroad to the West (U.S.A.), and to the East (Australasia), and to the North (Canada), and to the South (Africa): and in thee and in thy seed shall all the families of the earth be blessed.Genesis 49:21 Naphtali [is] a hind (bok) let loose (spring): he giveth goodly words. Deuteronomy 33:23 And of Naphtali he said, O Naphtali, satisfied with favour, and full with the blessing of the “I AM”: possess thou the West (Argentina) and the South (Africa). Brit-ish is Hebrew for Covenant-men/ people, from the two Hebrew words Berit and Ish – the true Israel people. Yes white people … who maintained and still do, also in other parts of the world, legislation, which is fraud, instead of The Laws of God. And the whole world copies them. King of kings’ Bible Matthew 5:17 Think not that I am come to destroy The Law, or the Prophets: I am not come to destroy, but to fulfill. 5:18 For verily I say unto you, Till heaven and earth pass, one jot or one tittle shall in no way pass from The Law, till all be fulfilled. The rebellion/insults against God is demonstrated in the fact that the old South African flag has Satan’s colour on top; orange, for the blood stained earth, where Satan the Red Devil (Rev./Apoc. 12:1-9) walks to and fro seeking to devour and destroy (1 Peter 5:8), and God’s colour blue – sky where He lives, at the bottom; beneath Satan – can’t get more insulting than that. And the black/ANC flag just copies the old South African flag with the red on top. They also insult God, but worse for the whites, the ANC just copied them – British Naphtali, the descendants of (UNION of) JACKob’s 10th son. 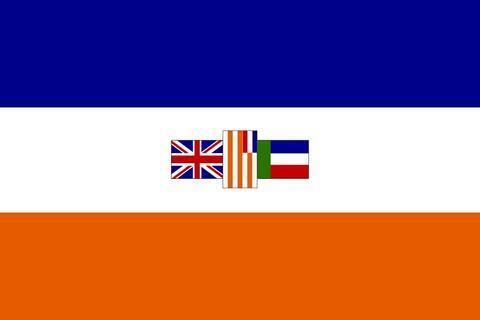 The British flag, which is inside the old South African flag, is Christ’s flag. Who would be stupid enough to reject Christ’s flag? South Africans apparently – compounding the curses of The Laws of God on themselves. The national cricket team were stupid enough to reject the Springbok emblem, and I’ll bet you they’ll do as well as the rugby team if they aplogise and take it back. To show God that the insults have stopped, both flags must also be flown with the blue on top. And upside down flags send a distress signal for help, but, in this case, it’s to GOD. Who better to call on for help than God? NO-ONE. I tell you for a certainty that ONLY those, black white or other, who follow God and therefore His Law/Covenant, and not the fraudulent legislation that pervades the Earth, will survive. Even the Afrikaner prophet Siener van Rensburg said there were many problems with their church, which, by not returning to God’s Law and NOTHING else, still supports Satan and his legislation, like absolutely all organised religions do. The 15 minute movie at the link has more profound information about the old South African flag.